Your son or daughter will always remember their 16th birthday party when you have a party with ACE DJ Entertainment at the helm. Turning sixteen is a major accomplishment and we would love celebrating it with you, your sons and daughters and their friends. Our sweet 16 DJs are experts at knowing exactly what type of music that your kids listen to and want to hear. 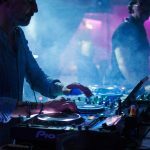 There are no “wallflowers” and no one left out when you hire and ACE DJ as they know exactly how to engage the crowd and get everyone dance. Give us a call, Chat with us or fill out our form to get started and make your party an ACE!